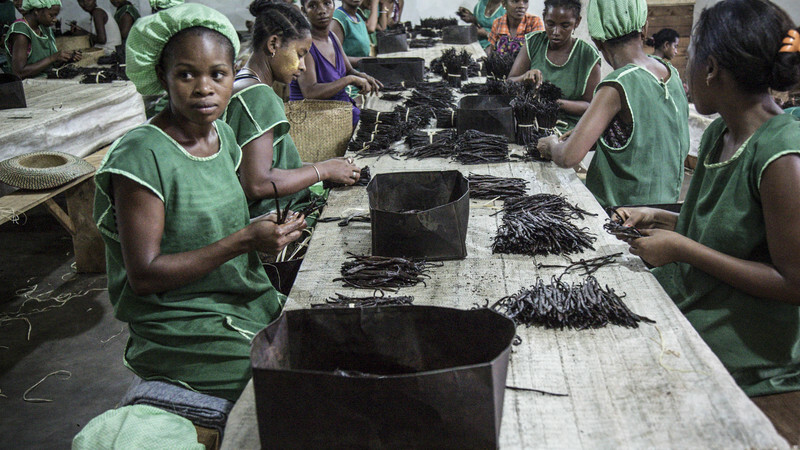 Women sorting sundried black vanilla pods. Credit: Natalie Bertrams. Hostwriter Story Prize winners Ingrid Gercama and Nathalie Bertrams tell us about the obstacles and challenges they faced doing the awarded reportage Vanilla fever: Fear sours the sweet scent of Madagascar’s success in Madagascar. They worked with local journalists they contacted through Hostwriter, who wouldn’t be able to do the story because “it was dangerous” for them. At the moment they are working in a joint project in DRC Congo, supported by the EJC. Olalla: If you had to choose a decisive moment doing this story, which one would you highlight? Ingrid: The best moment of this coverage, when the story really clicked, was when we met Dominique Rakotoson. He was a vanilla trader and told us about all the criminality behind the vanilla production. He led us into the illegal trade of vanilla. It was really interesting. We went into it expecting that it would be a sweet story about vanilla and we uncovered hard-core crime. Nathalie: It was when we missed our flight to the area that we met up with other journalists who told us about corruption and the poor living conditions of the farmers. There was a bigger story. They said they wouldn’t be able to do the story because it was kind of dangerous, and led us to Dominique. Olalla: How did you use Hostwriter for the investigation? N: We contacted journalists there and met up with them. We gathered recommendations about with whom we should meet and then we went for coffee and chatted a bit about the situation. I: We got leads from local journalists and followed these leads and then went back and asked “is this right?” or “did we get that wrong?” It was a really helpful collaboration. We could help them get out the story because we’re not in the firing-line as much as they are. N: I remember the two we met said they won’t work with us because it was too dangerous for them. O: Could you tell us about the main obstacles you faced doing this story? N: We tried to talk to as many stakeholders as possible in this business, from farmers to hustlers’ on the street. To get into warehouses wasn’t very easy and we didn’t manage to talk to warehouse owners. The main obstacle was, I think, language (Ingrid agrees). We didn’t have a fixer there who could help us, and we didn’t have a good translator, so we were basically stuck without language. It was difficult to get to the big shots and people’s comments on record. Everyone was afraid of consequences. I: To get comments from officials was another challenge besides the language issue. Local government officials wanted to say something but were afraid of the repercussions. And officials in the capital, Antananarivo, didn’t want to talk to us at first, but we insisted and they spoke! Some people were really speaking out about it, but anonymously. O: Is there something you would have done differently now that you have finished the piece and it is already published? I: I would have liked to go much more in depth. Unfortunately we didn’t have the time but it would have been fantastic to revisit and to try see the illegal wood trade, go to the village where it’s happening, talk to the big timber barrens. It would have been much of a longer investigation than what we have funding for unfortunately. N: Once we got that deep and wanted to do more on it, time and funding ran out, so we had to leave – at a point when it really started to get interesting. O: Do you think about going back and doing a follow-up of the story? I: We would love to do it. The question is funding. We’ll have to plan it very well to try and get access to very high-ranking people because we were referred to the Prime Minister’s office. To be able to do that kind of reporting, we’d need to have the support of a very big media and enough funding. O: What are you up to at the moment? I know you’re still working together, so I guess you’re a good team. Tell me about your story in DRC Congo; whatever details you can share, of course. I: It’s really fantastic working with Nathalie. We’ve been doing it now for a couple of years and it works really well. We’re writing together, we’re coming up with a story together and then doing the reporting together. Currently we’re working on a story about the Ebola outbreak in DRC. We’re trying to figure out the human perspective of it, what it was like for the first patient with Ebola, how was his entire community affected by it and what’s the status now that the outbreak in that part of the country has come to an end. N: Talking to all these people who were affected, all the families and communities and seeing how they perceived it, what happened to them, what did the international community do, what did the government do and what they are doing now with the new outbreak. O: Did you work with a fixer there? N: We tried to work with a journalist colleague and hired him as a fixer. He’s a good journalist and he’s reporting on Ebola as well. The night we arrived he was not there and then we learned that he got arrested, so he couldn’t help us anymore. He’s fine, though, everything went well. It was kind of a warning to him, and we’ve heard it happens quite often to journalists there right now because of the upcoming elections. I: He was working on a story about mining that didn’t go over well with the government. We tried to connect to other people, but the first outbreak was in such a remote area. We met a couple of journalists there, but they didn’t have English skills, so we ended up going with someone who could speak English, who was doing research work before. After that, we did end up working with two journalist colleagues, which was great.